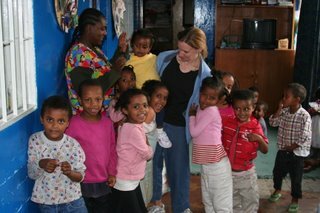 Yesterday we had a party at Layla House so that the children could say goodbye to Manyazewal and Mihret, and to Sammy and Ashenafi (who left for Chicago at 4am). It was a fun time. The energy as 130 other children gathered to sing and clap and give us their best wishes was powerfully uplifting. At the same time, though, there was a real sense of loss for so many of these children. Even as they blessed their friends, they also wrestled with reality that they would not be getting on an airplane and going to be part of a family. They would be staying behind; some in the knowledge that a family had chosen them, but that they needed to wait a little longer, but many more knowing that they still had no family, that for some reason they had been passed by again. 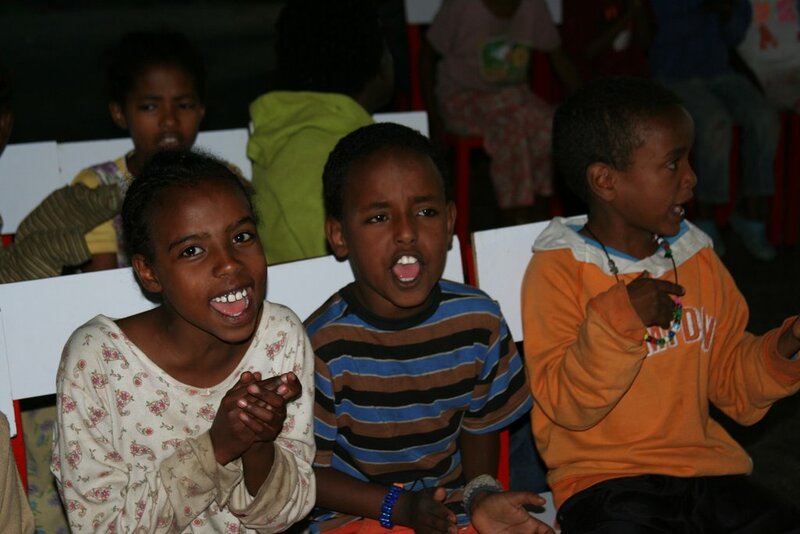 Helen, Tadiku and Jonas clap and sing while the children gather for the party. Julie and Mihret are surrounded by an enthusiastic bunch of well-wishers. Everyone wanted to give Manyazewal and Mihret kisses and hugs, they were truly excited for them. And it is not just that there are a lot of good kids who are without families and so need to be loved (in some distant idealistic way), it’s that I have already fallen in love with some of these particular kids. In the few times we’ve been there just to say hi and let the kids visit, we’ve met some spectacular children who I would (if I was legally able) take home with us right now. I’ve only known these kids for a few hours, but they are so precious to me that I just cannot stand that I will walk out the gate and leave them behind. I guess that's the danger of getting in too close. You can't cling to the illusion that these kids are "statistics." They have names and faces now, and I will look at the world differently because of them. I know that our little family cannot save the world. I know that we cannot even save all these little ones. Adoption isn’t really about “saving” anyway. And, in some sense, these kids have already gained so much. We see so many orphans just driving across town. They surround the cars at stoplights trying to sell gum or pens or packages of Kleenex. They beg on the street corners. They do not go to bed having had a hot meal or a shower. They don’t have adults who care for them. They don’t get to attend classes. They don’t have clean clothes, or even adequate clothes sometimes. 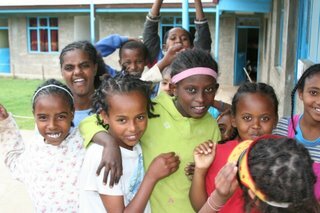 Compared to their fragile existence, the kids at Layla have a relative paradise. But it still isn’t a family, and “research shows” that until they get that one, key ingredient, these kids don’t have a discernable future. Our camera was a big hit. The ability to instantly show the kids their picture in our digital preview window was a quick way to break the ice, and moments after you started clicking the shutter, a group would form. Every kid, without exception, loved seeing themselves imortalized in the tiny window of the camera. The pain is real, and it is difficult for me to deal with. So, I hid behind the camera, then let them see themselves in the little preview window, and, for the moment, distracted us both from the hard reality of their situation. I prayed that their family-to-be would find them soon and that there would soon be a party with their name on it, and that room would be opened up for some other lost child to find a way into the caring arms of Layla House. I suppose when you cannot do enough, and you know you cannot do enough, you can either be defeated by your inadequacies or you can do what you can, adding your little bit, and praying that others will be called to add their little bits until it is enough. There is an Amharic saying I found in my phrasebook (I knew it would be useful! ), “Spiderwebs joined together can catch a lion.” The orphan situation in Ethiopia, much less the world, is one heck of a big lion… I guess every little strand counts. Wow, I just spoke to your mom at the library and she let me in on your blog, sounds like your house is full of love, joy and excitement! Children are a blessing from the LORD. Your words are encouraging.